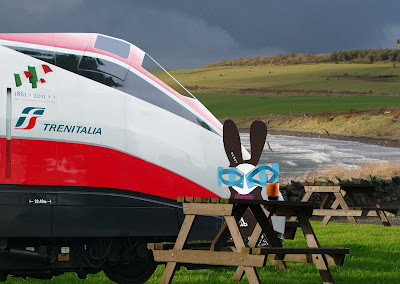 Quantum, the Time Travelling Train, made a surprise stop on the way home and the Wabbit found himself at a picnic table with glass of carrot juice. "I know this place," said Wabbit in recognition. "This is Galloway in my homeland!" "Welcome home, Commander, " said Quantum. "Oh, thank you!" said the Wabbit and he sipped his carrot juice and breathed the air. "Since this is a kind of works outing," said Quantum, "I believe we are obliged to sing." The Wabbit felt overwhelmed by choice. "What can we sing, what can we sing?" he mused. "Something of the land," advised Quantum. "The Rolling Hills of the Border!" said the Wabbit. "You start," said Quantum. The Wabbit placed a paw over one ear, threw back his head and sang. "There's a certain peace of mind, Bonnie wabbits there you'll find." "Wabbits sturdy, yet so kind, Among the hills of the border," sang Quantum. They both chuckled. "How do you know the words?" asked the Wabbit. "I know most things," said Quantum. "I know your uncle is the Chief of Galloway." "Distant uncle," said the Wabbit. "Isn't that him over there?" asked Quantum. "Time to get going," said the Wabbit. Quantum was surprised. "He's very nice but he's inclined to chew my ear off," said the Wabbit. "We'll quietly vanish," said Quantum. And they did.